We offer two USPA approved training methods for skydiving solo – AFF and IAD. Both get you in the air solo. Both start you on your way to being a licensed skydiver. Once you’ve decided that you want to jump solo, these are the steps you need to get started. Enroll in our ground school – the first step for whichever training method you choose. Choose between the two methods offered – Accelerated Freefall or Instructor Assisted Deployment. Make your first jump using the training progression you have chosen. 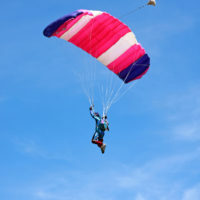 Summary: Quickest method to independent skydiving. Least expensive entry into the sport. progress from instructor deployment to solo, then freefall. Training: Several hours of ground school. Several hours of ground school. Instructors: Jump with 2 instructors who hold onto student in freefall. Jump solo, with assistance of 1 in­structor. Freefall: Freefall for 14000-10000ft. feet (30-60 seconds) on your first jump. First freefall on around the 6th jump. Deployment: Student is expected to deploy their own parachute. Instructor deploys for you on your first few jumps. Parachute: Student is alone under canopy. Student is alone under canopy. Cost: A little more. A little less. As soon as you’ve finished your AFF or IAD progression, and have been cleared for self-supervision by your Instructor, you’ll be able to make solo jumps. Check out our pages on AFF TRAINING or IAD TRAINING for specific details about the jumps involved to get there. Once qualified to jump solo you will begin jumping with one of our USPA-rated coaches. Coaching jumps will help you gain the skills required to jump with other people. You need 25 jumps altogether to fulfill the USPA ‘A’ license requirements. Once you’ve reached 25 jumps, you’ll have a final “check dive” with your instructor to confirm all the body flight and canopy skills you learned with your coaches. After passing that and a small written test, you’ll be an officially licensed skydiver! Of course, this is really just the beginning. Where will skydiving take you? When you’re ready to take your skills to the next level, Skydive Tecumseh will be right here with you, helping you to attain your B, C, and D licenses, and beyond! For more information on USPA licenses, check out our Licenses page. 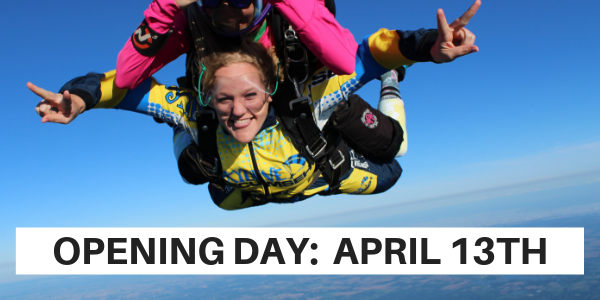 Balloon and helicopter jumps, learning to freefly, wingsuit*, and more… the possibilities are limitless in your skydiving career!